MUMBAI: It‘s flag hoisting time on Hungama TV! 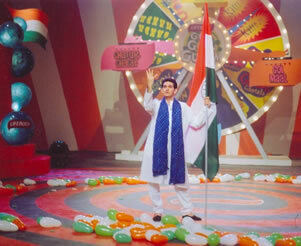 On Independence Day, the channel will be airing a special episode of Gol Gol Gullam at 6.30 pm. The I-Day special features Sameer Kochchar, a popular host of kids‘ show Full Toss - a cricket-based show, which has teams from schools all over India participating on Hungama TV. Kochchar‘s appearance in Gol Gol Gullam adds a different dimension to the show, as we see both Omang Kumar (the host of Gol Gol Gullam) and Kochchar fighting it out with each other on who is a better host. An interesting war of words follows between them as they support respective teams and encourage them to defeat the other. In the last game, the duo will play against each other along with the teams.